Man-Made Vitreous Fibres (MMVFs) are used in thermal and acoustic insulation materials such as glass wool. The measurement of the diameter and length of these MMVFs is useful for the insulation industry, and serves as a quality control tool for process development. Hundreds of measurements are necessary to obtain useful information about the material, but manual measurements of the diameter and length of so many fibres is long and tedious (and unreliable in the case of insufficiently skilled or tired operators). This motivated the development of an automatic measurement process, which can be carried out using image analysis. The majority of MMVFs used in the insulation industry appear as relatively regular elongated cylinders, with a diameter varying between about 0.2 – 20 microns and a length varying from about 1 – 1000 microns or more. A significant minority of these fibres are in some way irregular: non cylindrical fibres (cone portions), fused fibres, broken fibres, etc. Due mainly to the small diameter of the thinnest fibres, the use of electron microscopy techniques is a necessity to obtain high-quality images of such materials. Due to the extreme range of fibres lengths, it is difficult to measure both the diameter and the length of each fibre with accuracy in reasonable times. Here, we briefly present one method for measuring the diameter of MMVFs automatically using image analysis techniques. This method involves a flat-bed sample preparation method. We will also indicate how to obtain some information on the length of the fibres when possible. A tuft of binder-free MMVFs is extracted from the material. A small quantity of fibres (about 100mg) is obtained with a punching tool. These fibres are dispersed in aqueous solution and filtered through a track-etched polycarbonate filter. The filter with the fibres on it is then coated for observation in a SEM in BSE mode. This procedure is illustrated by Fig.2. A portion of a typical example of an image aquired in this way is shown on Fig.1(a). In this example, large and small fibres are segmented in the same way. The coloured line in the center of each segmented fibre section indicates which object the section belongs to. Note that the parallel fibres on the left of the images have been recognized as two distinct fibres, and that the segmentation procedure is not confused by fibre crossings. The segmentation procedure is entirely automated and takes about 30 seconds per image on a PC-pentium 90 running under Unix/NeXTStep. The images in Fig.3 have been reduced and compressed. Normal images are 560x510. All measurements are made at a magnification of x1000 on 560x510 images. An individual pixel in these image is 0.162 microns in width and height. Fibre diameters are measured using the distance transform information, averaged along the skeleton of the fibres, and fibre length using the skeleton length information. In addition to the fibre diameter and length, the number of visible fibre extremities of each fibre is also recorded. As shown in Talbot et al. 1997, this extra information provides an unbiased diameter histogram as well as the mean length by diameter class, which in turns allow to build the length, area and volume weighted histograms. As can be seen, the correlation is generally excellent, except for two points which correspond to a sample with extremely thin fibres (median diameter below 0.5 microns) where both the image analysis procedure and the human measurements break down at the chosen microscope resolution. Results improve when resolution is increased. A similar correlation can be obtained for length measurements. 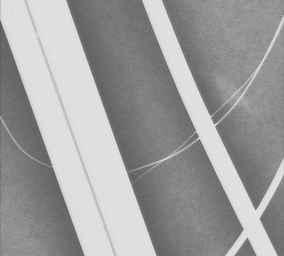 We have outlined an entirely automated method for measuring the diameter and length of man-made vitreous fibres. This method is in use in actual production plants for quality control and process development purposes. A typical run (diameter and length measured for 1200 fibres) on a product is entirely automated except for the sample preparation, and takes between 2 and 5 hours depending on the product. This is much faster and just as accurate as manual measurements. Talbot, H. Analyse Morphologique de Fibres Minerales d’Isolation. PhD Thesis, Ecole des Mines de Paris. Oct. 1994. [In French]. Talbot, H. and Jeulin, D. and Hobbs, L.W.. Scanning Electron Microscope Image Analysis of Fiber Glass Insulation. MAS/EMSA Conference, Boston, 1992. Talbot, H. and Jeulin, D. and Hanton, D. Image Analysis of Insulation Mineral Fibres. Microscopy,Microanalysis and Microstructures, to be published, 1997.